Figure 1. Effects of substituting manure for fertilizer. Estimates are averages from an analysis of 141 research trials. Abbreviations: nitrogen (N), carbon (C), microbial biomass N (MBN), microbial biomass C (MBC). The average of all grain related trials demonstrated a 5% increase in yield for manured fields (see Box A in Figure 1). The authors suggested that manure increases soil microbial biomass N (see Box B in Figure 1), the living component of soil organic matter. As organic material is decomposed, MBN is slowly converted to inorganic N at a time more in sync with crop N uptake, improving crop N uptake and crop yield. In addition, the authors suggest that the increased levels of other nutrients and improvements in soil physical properties also contributed to observed yield increases. Minimizing mineral N in soils while meeting crop nutrient requirement protects our water and air resources. 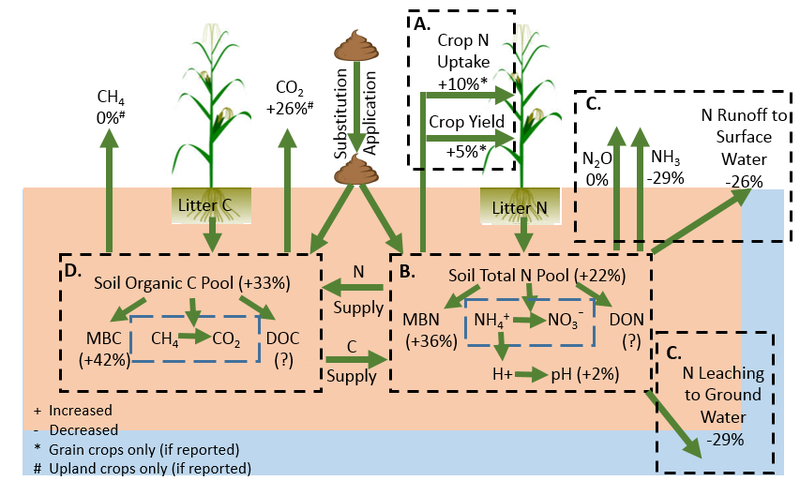 Replacing fertilizer with manure resulted in decreased ammonium (NH4) losses to air and N losses to surface and ground water by more than 25% (see Box C in Figure 1). These benefits were observed regardless of crop, manure type or substitution rate. The authors attributed these environmental benefits to both improvements in crop N use efficiency and greater N storage as microbial biomass nitrogen that is released closer to crop’s N utilization timing. This study also reported increases in water stable aggregates and cation exchange capacity for manure amended soils; this helps hold ammonium-N in the root zone until the crop can use it. Previous articles have summarized the benefits of manure for increasing soil aggregates and preventing runoff and erosion losses to surface water. This review also highlighted the benefits of manure for increasing soil organic C. Much of this increase in soil C was in the form of soil microbial biomass C (see Box D in Figure 1). Manure provides an energy source for soil microbes, which significantly increases soil microbial activity and improves soil storage of both N and C in soil organisms (see Michigan State University Extension Publication – Manure effects on soil organism and soil quality). 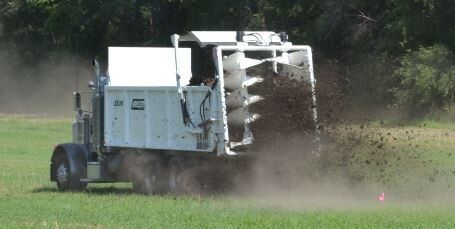 Increasing soil C levels can increase the risk of greenhouse gas emissions. However, this study suggested there were no changes observed in emissions of potent greenhouse gases, nitrous oxide (N2O) and methane (CH4). However, some increase was observed in CO2 emissions due to greater soil microbial activity. Overall, manured soils proved to be a sink for carbon in upland fields, thus benefiting the environment. Substituting manure for commercial fertilizer has positive societal benefits for food security (increased yields) and for environmental protection (less nitrogen loss and lower greenhouse gas emissions). Not addressed by this review is potential phosphorus losses to surface water. Manure is known to reduce erosion and runoff losses but phosphorus loss can increase if soil P levels are allowed to increase above optimum levels for crop production (see previous article).